London, February 05 (KMS): Former Norwegian Prime Minister, Kjell Magne Bondevik, has emphasized that the Kashmir dispute should be high on the agenda of the international community and resolution of this dispute should be a priority for all. Kjell Magne Bondevik said this while talking to Pakistan Foreign Minister, Shah Mehmood Qureshi, during a meeting in London. The former Norwegian Prime Minister reiterated that there was no military solution to the Kashmir dispute and that peaceful and meaningful dialogue was the only way forward. He reaffirmed his commitment for the resolution of the lingering dispute in accordance with the aspirations of the Kashmiri people. Bondevik welcomed the initiatives such as the International Conference on Jammu and Kashmir. 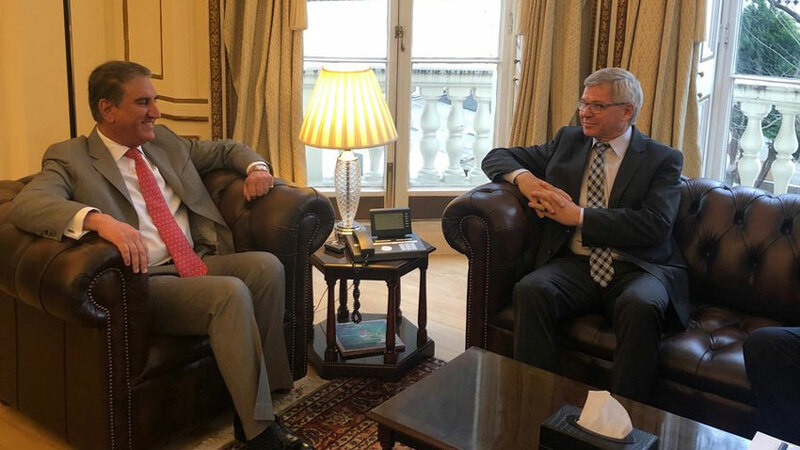 The Foreign Minister appreciated the participation of the former Norwegian Prime Minister in the International Conference on Kashmir and expressed the hope that the participation of prominent international figures would be instrumental in drawing further international attention to the grave human rights situation in occupied Kashmir and towards the resolution of this longstanding dispute. The Foreign Minister condemned the human rights violations in occupied Kashmir. He said that Indian atrocities against helpless Kashmiris were finally being acknowledged by the international community.